Lt. Suwilanji Musamba of the Zambian Defense Forces encourages fellow soldiers to participate in an HIV prevention strategy. Kafue, Zambia—Lt. Suwilanji Musamba, a member of the Zambian Defense Forces, never considered male circumcision an option. To Musamba, male circumcision was a cultural practice of a few Zambian tribes from the western and northwestern provinces. That was his thinking until he learned about the health benefits of circumcision performed as part of comprehensive HIV prevention services—reduced risk of contracting HIV by 60 percent, decreased chance of contracting a sexually transmitted infection, lower risk of cervical cancer in female partners and improved personal hygiene. 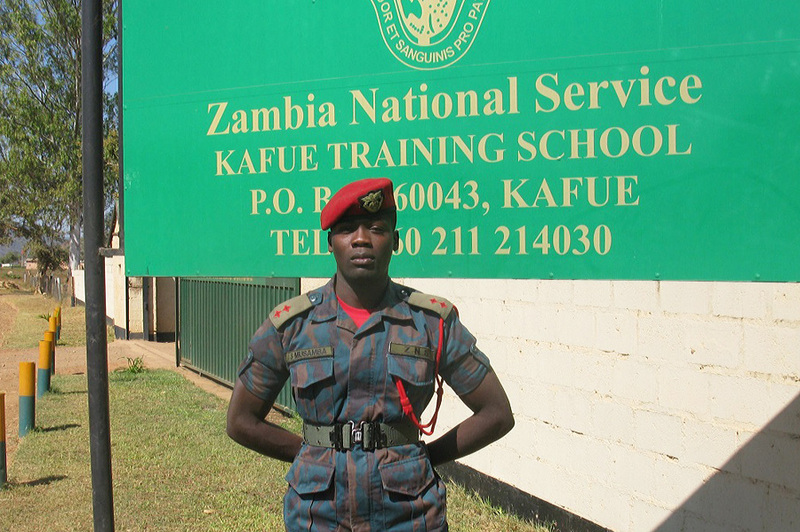 After continued reading, discussions with a military health counselor and much deliberation, Musamba decided to have the procedure performed through the health services at ZNS Kafue Military Training School, where he was posted. Since his circumcision, Musamba has championed the HIV prevention counseling and services to his comrades. In partnership with the government and with the support of Jhpiego, the Zambian Defense Forces have offered voluntary medical male circumcision (VMMC) as part of comprehensive HIV prevention services at selected sites since 2009, and 7,654 soldiers have chosen to protect themselves and their partners. This HIV prevention effort is funded by the President’s Emergency Plan for AIDS Relief through the U.S. Department of Defense (DOD) HIV/AIDS Prevention Program. The DOD effort supports HIV/AIDS prevention, care and treatment programs that are designed to meet the specific needs of military populations, their families and the communities that reside near military bases. Jhpiego works with military medical services in Rwanda, Malawi, Namibia and Ghana, as well as Zambia, as part of this support. Musamba has personally championed VMMC. During a deployment to Kaputa District in Northern Province in 2013, he talked up the benefits of VMMC with his platoon every morning. At the end of the exercise, 15 out of the 40 soldiers under his command received MC services. Likewise, he has been promoting the practice at home, encouraging his brothers to get circumcised. So far, three of them have chosen to be circumcised. The lieutenant says he participates in VMMC campaigns not only because he wants to save lives through the protective effect of VMMC, but also because he wants the Zambian Defense Forces to become a zero carrier of human papillomavirus (HPV), which is one of the leading causes of cervical cancer. He specifically requested that Jhpiego stock job aids in his base library so every soldier could access these educational materials. According to Musamba, many who received services have taken serious steps to teach others about the health benefits of MC. Lubosi Nyambe, a 26-year-old Lance Corporal at ZNS Kafue Military Training School who is a member of the non-circumcising Lozi tribe of Western Province, was among the beneficiaries. Nyambe, who is married and the father of two children, routinely received strong messages from fellow soldiers on health benefits of circumcision. During the 2013 national VMMC campaigns, Nyambe made the decision to receive services. Nyambe’s positive experience has led him to talk to other soldiers about the procedure. He believes that VMMC programs have significantly improved health awareness in the Zambian Defense Forces, especially about HIV/AIDS and the prevention benefits of VMMC. As a result, Nyambe has asked to be trained in VMMC counseling so he can better advise other soldiers on the comprehensive services that include the procedure.